Now you can master complex tax concepts and gain a thorough understanding of today's tax legislation with SOUTH-WESTERN FEDERAL TAXATION 2018: COMPREHENSIVE VOLUME, 41E. This complete, understandable book offers the most effective solution for comprehending individual taxation, C corporations, taxes on financial statements, and flow-through entities. You'll find the latest tax legislation for both individual taxpayers and corporations, as of the time of publication. Exceptional learning features, such as "Big Picture" examples, memorable tax scenarios, and "What If?" case variations clarify concepts. You also sharpen critical-thinking, writing, and online research skills that are important for success as a tax practitioner. Each new book includes access to H&R Block tax software, Checkpoint by Thomson Reuters (student edition), and CengageNOWv2™ online homework solution. 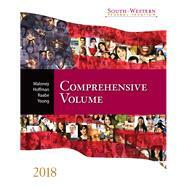 Depend on SOUTH-WESTERN FEDERAL TAXATION 2018: COMPREHENSIVE VOLUME for the complete tax coverage you need for success.